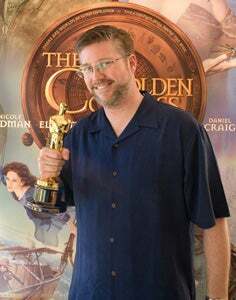 Last year, Bill Westenhofer (pictured), visual special effects supervisor at effects house Rhythm & Hues, won an Academy Award for The Golden Compass in 2008. "I have an 80 mage on Kil'Jadeen," Westenhofer told Kotaku. "Been playing since the original alpha testing days and am an officer in a casual raiding guild 'Concordis' on the KJ server." To recap: This year a WoW player won an Oscar for visual effects. Last year, a WoW player won an Oscar for visual effects. It's like playing World of Warcraft is a requirement or something. Adds Westenhofer, "There are lots of us out here with the WoW addiction..." No kidding!